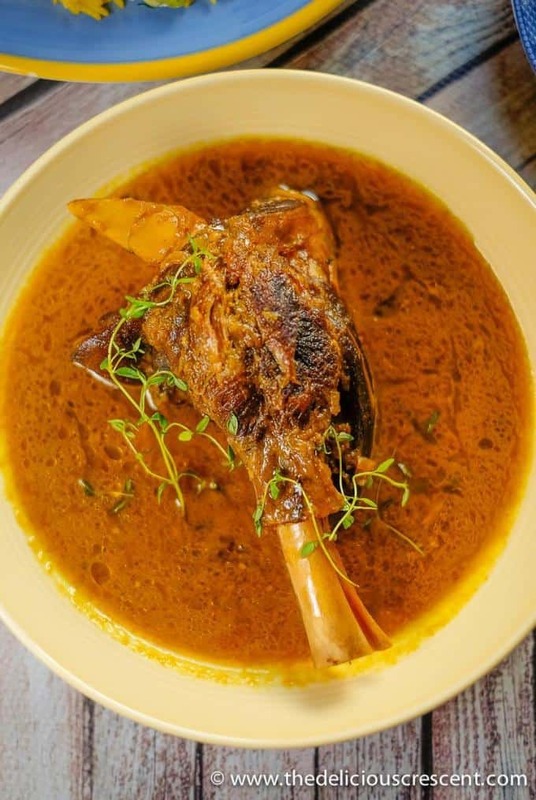 Braised lamb shanks slow cooked in a fantastic sauce with Persian spices, saffron, lemon juice and herbs makes a spectacular feast. Succulent lamb in an amazingly delicious sauce can also be cooked in oven or crock-pot!! Step by step photos at end of post. 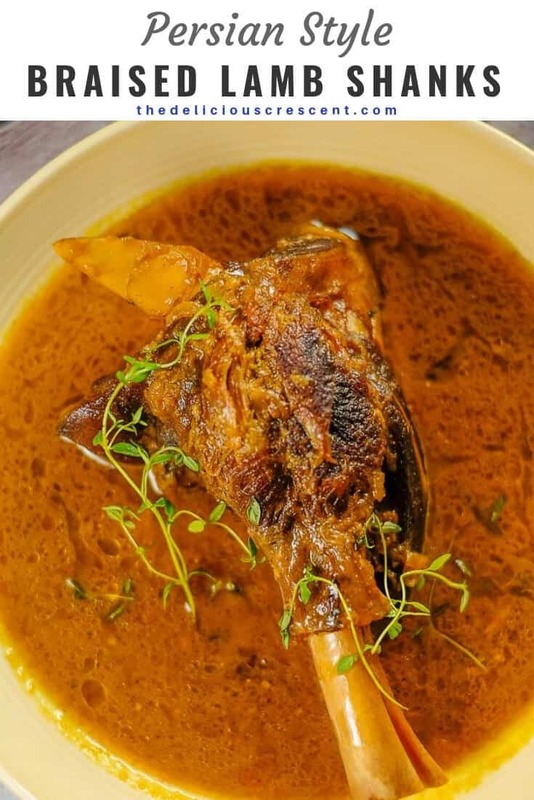 The meat of lamb shanks is tougher with more connective tissue. However, the simple trick of braising it and slow cooking in a sauce converts it into fabulously juicy meat that will just fall of the bone. Make sure to choose lamb meat properly…..more on that below. Years ago I had these amazing lamb shanks at a Persian restaurant in California. I have cooked it several times over the years and now have perfected it to this stunningly delicious recipe here. And the bonus with browning and then slow cooking lamb shanks is that it gives the sauce time to cook to silky perfection. 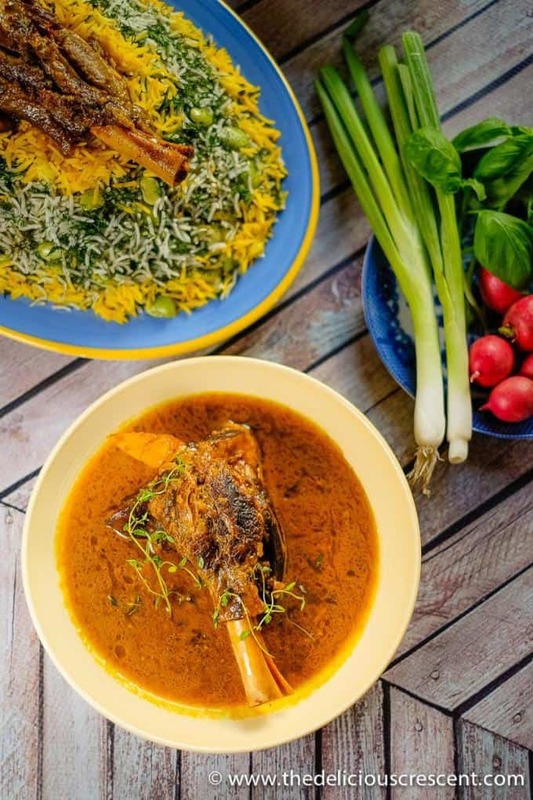 These braised lamb shanks work perfectly served with Baghali polo (Persian dill rice). 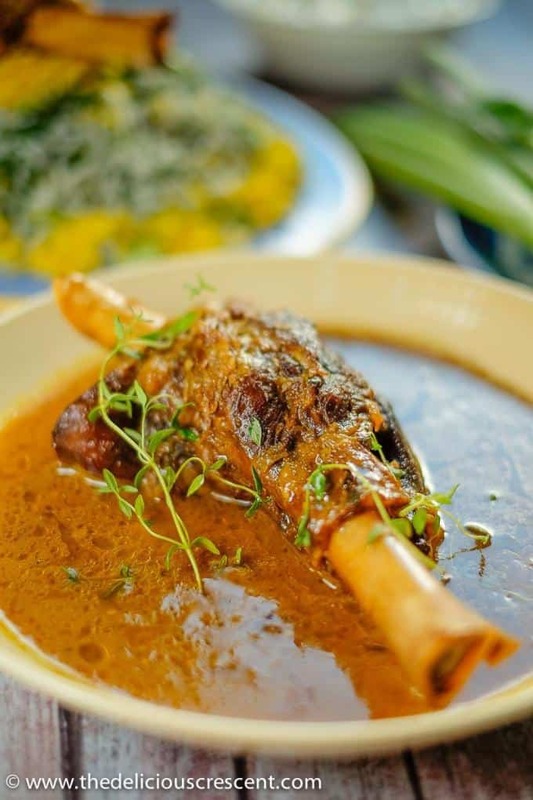 Lamb shanks are a good source of complete protein, supplying all the essential amino acids. They also provide plenty of vitamin B-12, niacin and selenium, in addition to being a good source of zinc, iron and potassium. I recommend you to choose grass fed lamb for better taste and health. Please do remember to consume red meat in moderate amounts. What else to serve with Persian Lamb Shanks? 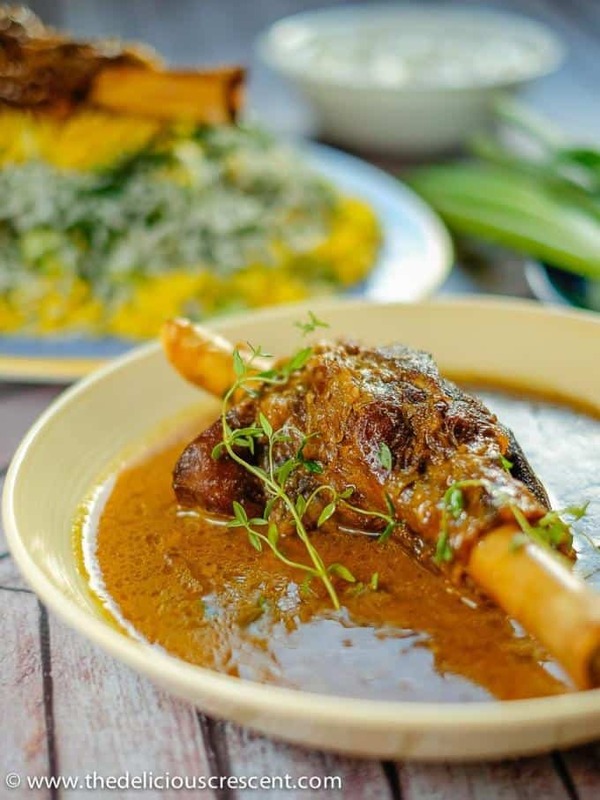 Apart from the Persian dill rice, these lambs shanks can be served with a flatbread like this Persian barbari bread or simple naan. It will also be great with a rice dish like this Zereshk polo (skip the chicken) or even plain saffron flavored rice. Just add some green salad, pickles, yogurt and olives to the spread. Make sure to brown the meat just on the surface. This requires that the pan reaches a high heat, but not smoking. Choose similar sized lamb shanks that are about 0.75 to 1 pound in weight each (300 to 400 grams approx). 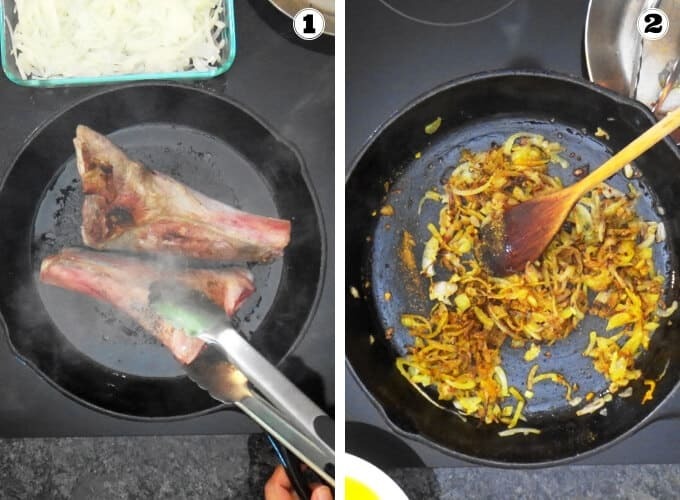 For more about choosing lamb shanks check this out. Make sure to not choose meat cuts from overly mature livestock. Use fresh herbs for best taste and flavor. Slice the onions thin so they can cook into a silky sauce. 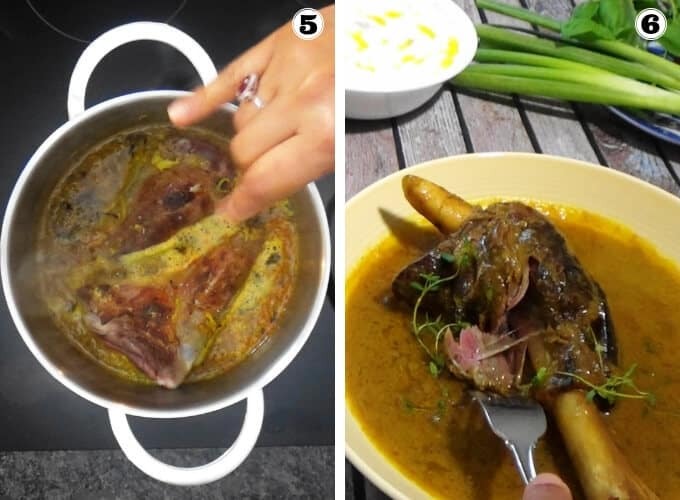 Persian lamb shanks can be prepared ahead and freezes well too. Heat one tablespoon of oil in a cast iron skillet over medium high heat. 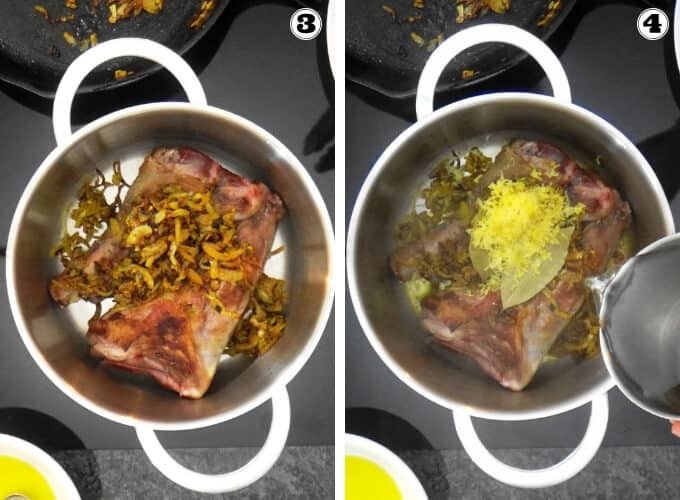 When the oil is hot, place the lamb shanks and season well with salt and pepper. You may work with two shanks at a time. Then brown the shanks well on all sides using a pair of tongs. It should take about 6 to 8 minutes. Transfer the seared lamb shanks and set aside. In the same skillet add the remaining oil and heat it. Then add the sliced onion and sauté until light golden brown. Next add the grated garlic and stir couple minutes. Add the Persian spice mix, and turmeric. Then turn of the heat. Transfer the lamb shanks and sautéed onion-spice mixture to a heavy pot. Add the saffron water, lemon juice, bay leaves, thyme (or dill) and the lemon zest. Add about 2 cups of water and bring it to a boil, and then lower the heat and let it simmer for about 1½ to 2 hours until fork tender. The meat should be falling of the bone. Adjust the seasonings as per taste. Transfer the lamb shanks to a serving dish. Cook down the sauce further if it is too thin and then pour it over the lamb shanks. Or you may strain the sauce and then cook it. Discard the bay leaves. Tip: You may also cook this from start to finish in a dutch oven or a heavy bottomed pot that heats up well for browning the meat. And cook the lamb shanks in the oven at 325 degrees F in an oven safe dish making sure to seal it well or use a fitting lid. Brown the lambs shanks and prepare the onion-spice-herb mixture. Transfer to slow cooker. Add the water and cook according to the instructions for about 4 to 5 hours at high or 6 to 8 hours at low setting. Be sure to brown the meat just on the surface. And this requires that the pan reach a high heat, but not smoking. Do not choose meat cuts from overly mature livestock. For a silky sauce, do slice the onions thin. Braised lamb shanks can be prepared ahead and freezes well too. 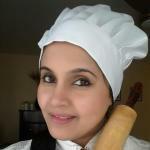 Advieh (Persian spice mix) recipe is on the blog. May also substitute it with a good ready made middle eastern or eastern Mediterranean mixed spice blend. You may use 1 tbsp dried lime powder instead of lemon zest. Lower the amount of lemon juice as per taste. Brown the lamb shanks and saute onions with spices. Transfer lamb shanks and onion-spice mixture to the pot. Add herbs, lemon zest, saffron, lemon juice and water. Bring it to a boil and simmer. Cook until fork tender and meat is falling of the bone. I just adore lamb. I am not a meat eater at all, but some how I love lamb and will eat it any time any way. This is making my mouth water! Thanks Claudia. Hope you try it :) I love lamb too! Such a hearty sounding meal that looks like it’s bursting with Amazing flavors. These lamb shanks look TO DIE FOR good! Thank you for the tip on adding sugar to the saffron to help in grinding. I didn’t know that. Thanks so much Lisa :) Sugar or salt, both will work. This amazing recipe is going right into my must-make for my fiance file. He is not only a lover of all things lamb, but is also on a Persian food kick lately! Oh that’s awesome :) Hope you enjoy making it. Thanks Lauren. Thanks Tisha, then you must try it. They turn out so tender.